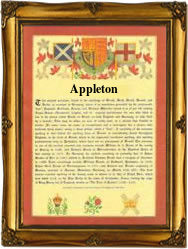 This name is of Anglo-Saxon origin, and is locational from any of the several places thus called, for example Appleton in Cumberland, Lancashire, Yorkshire, Norfolk, Cheshire, Berkshire and Kent. Recorded as "Apeltun" and "Epletune" in the Domesday Book of 1086 for the various counties, the name derives from the Olde English pre 7th Century "aeppeltun", an orchard, a compound of "aeppel", an apple, plus "tun", an enclosure or settlement. The surname is first recorded in the latter half of the 12th Century (see below), and other early recordings include: Thomas de Appleton, who appeared in the 1196 Pipe Rolls of Yorkshire, and William de Appleton, who was Rector of Titchwell, Norfolk, in 1376. Recordings from London Church Registers include: the marriage of John Appleton and Elizabeth Mylls on June 2nd 1561, at St. Dunstan in the East, and the christening of John, son of John Appleton, on January 30th 1567, at St. Botolph without Aldgate. In 1622, one Richard Appleton, aged 19 yrs., appears on a list of early emigrants into Elizabeth City, Virginia. Henry Appleton (flourished circa 1650) was a navy Captain and Commodore who served in the Dutch War (1652). The first recorded spelling of the family name is shown to be that of Hemeri de Lepeltone, which was dated circa 1182, in the "Red Book of Worcestershire", during the reign of King Henry 11, known as "The Builder of Churches", 1154 - 1189. Surnames became necessary when governments introduced personal taxation. In England this was known as Poll Tax. Throughout the centuries, surnames in every country have continued to "develop" often leading to astonishing variants of the original spelling.